Reveal your sumptuous style wearing the FUZZI™ Botanical Floral Tulle Print Off the Shoulder Pencil Dress. Professional dry clean or hand wash and line dry. 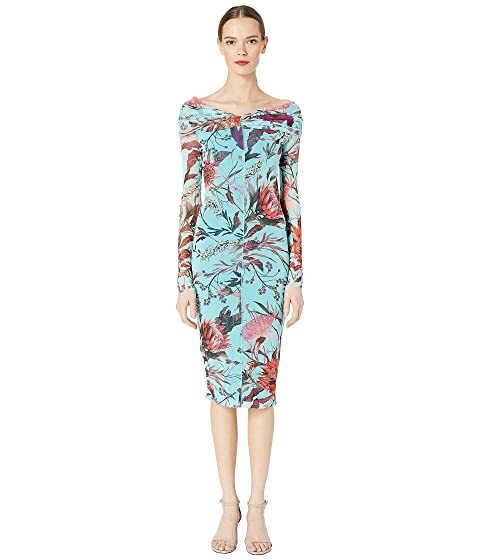 We can't currently find any similar items for the Botanical Floral Tulle Print Off the Shoulder Pencil Dress by FUZZI. Sorry! This dress is a total wow! Had to get it shortened which turned out to be complicated because of the stretchy, gauzy nature of the fabric. The shawl, off-the-shoulder collar tends to pop up if you raise your arms and there isn't a way to effectively tack it into place. But it's gorgeous and worth all the minor problems.